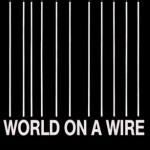 More than 25 years before The Matrix made its studio release, there was World on a Wire. Does this scene look familiar by any chance? If you are a sci-fi enthusiast interested in a film that is like The Matrix, it is my pleasure to introduce you to Welt am Draht / World on a Wire, a German Made-For-TV Sci-Fi Film directed by Rainer Werner Fassbinder. Having lived in Berlin for a brief period of time, I was fortunate enough to be present during the re-release of this film at the 2010 Berlinale Film Festival. I doubt I would have learned of this newly discovered gem had I not been present in the city and read the reviews in the local German press. 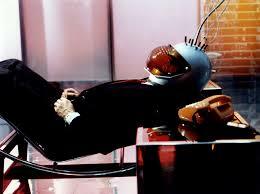 Can World on a Wire Be Considered One of the Films that Inspired The Matrix? It doesn’t take a massive leap of faith to see the parallels between both films. As a general rule I am quite against plot spoilers and even go to such length that a simple reference to the film’s name will do. I’ll bend my personal rule slightly for my audience as my goal is to entice you to consider exploring this film. Without giving much away, World on a Wire centers around a man caught between a virtual reality world and real life. I’ll spare you the excitement that this film is purely a drama with limited action sequences. The similarities are between the plot lines and ultimate questions both films raise: Is our world nothing more than a simulation? What is reality? Who is our creator? The films have utopia/distopia themes that draw heavily from Greek philosophy. Finally, both are visual masterpieces, and in the case of World on a Wire, quite amazing for the early `70s. For all I know the Wachowski Brothers might not have ever heard of World on a Wire. In just about all cases though, the influences of art can be traced to some previous source, and World on a Wire is no different as it was based off of the American author Daniel F. Galouye’s book Simulacron-3. For its dystopian nature World on a Wire reminds me of Network and Rollerball, although I find it superior. Many of the scenes are downright creepy, yet visually stunning, especially the sets. Although Fassbinder was not a Sci-Fi director, I highly recommend this film if you are a fan of the genre, and if you’ve never seen a Fassbinder film, let it be your introduction. Click here for the trailer.